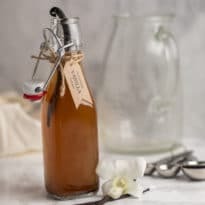 Skip the synthetic versions and avoid the high prices at the market: Learn how to make vanilla extract from scratch. Use it for baked goods, drinks, and all your favorite vanilla bean recipes. 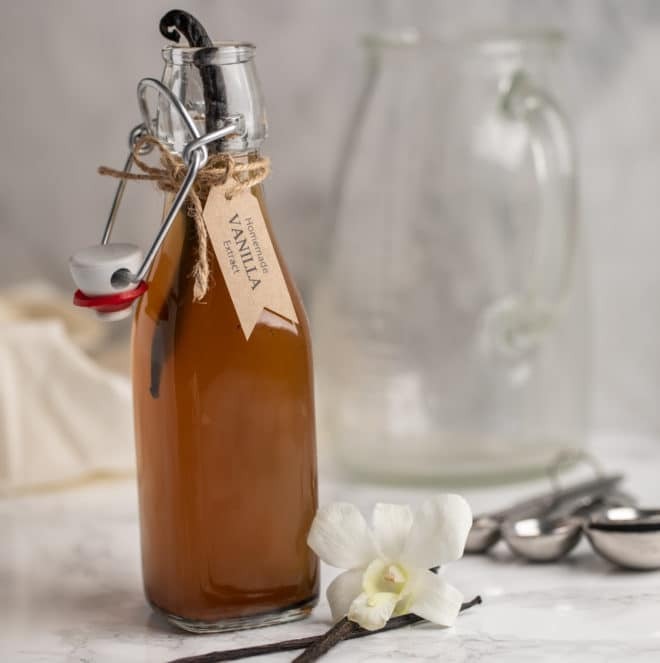 This homemade vanilla extract recipe takes just two ingredients and a pretty bottle! There’s simply no substitute for the intoxicating allure of vanilla. Nothing comes close to the perfect, flora aroma of pure vanilla extract. However, because vanilla extract is so expensive, 98% of vanilla used as a flavor and fragrance is actually synthetic. Much of the extract that’s out there is just a mishmash of chemicals that smell like vanilla but don’t deliver the goods. Therefore, I think it’s worth it to make your own, and have the best quality vanilla extract ever. And it’s completely, absolutely simple to make. The process takes a few weeks for steeping, but I can’t think of a lovelier gift than a pretty glass jar filled with the very best vanilla extract, made by you. 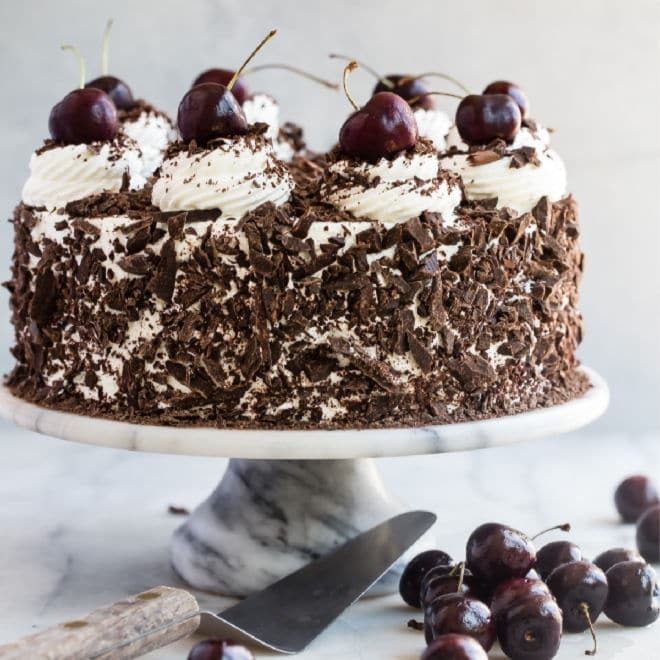 Get started now, and in a little bit you’ll have a handmade gift for the cake and cookie baker in your life. I’ll bet you get something delicious soon, just for thinking of them. Vanilla extract, or essence, is made from vanilla beans, those long, dark pods you might see with hefty price tags at gourmet shops. 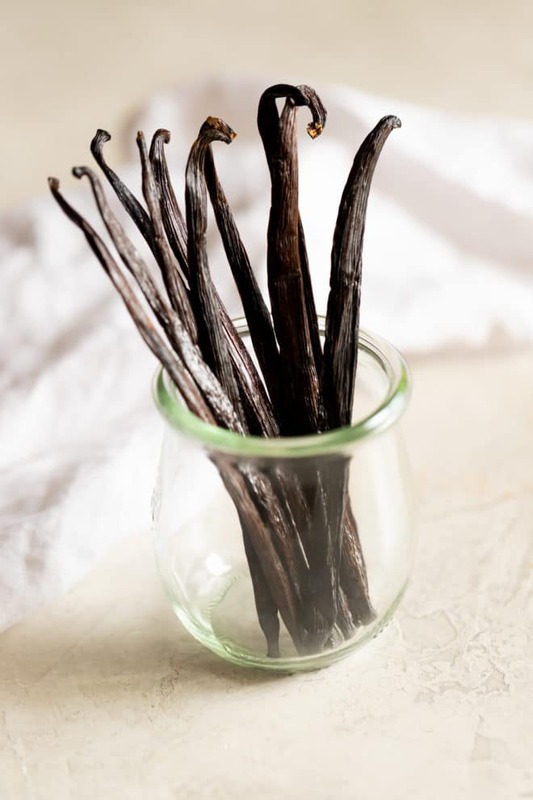 Vanilla beans, also known as vanilla pods, are the edible fruit of a tropical orchid which thrives along the equator in Mexico, Ecuador, Tampico, and the Caribbean. Throughout Mexico, vanilla is considered sacred and is still a very important part of the culture. Vanilla is valuable because it’s the most precious and labor-intensive agricultural crop in the world. First of all, the vanilla plants take an average of 3 years just to start flowering. When the fruit appears, it must hang on the vine for a minimum of nine months to develop that lovely aroma we all know and love. As if that’s not long enough, once the pods are harvested, they dry out and cure, almost entirely in the sun. This drying process shrinks the beans to about 20% of their original size. Talk about return on investment! After the beans dry, they’re sorted by size and quality. Then they age for another month or two before they show up in the marketplace, ready to be used. Whew! The good news is that homemade vanilla is more economical in the long run, especially when you find a good source for beans. Even though I’m a big fan of buying local, when it comes to vanilla beans, I only shop online. 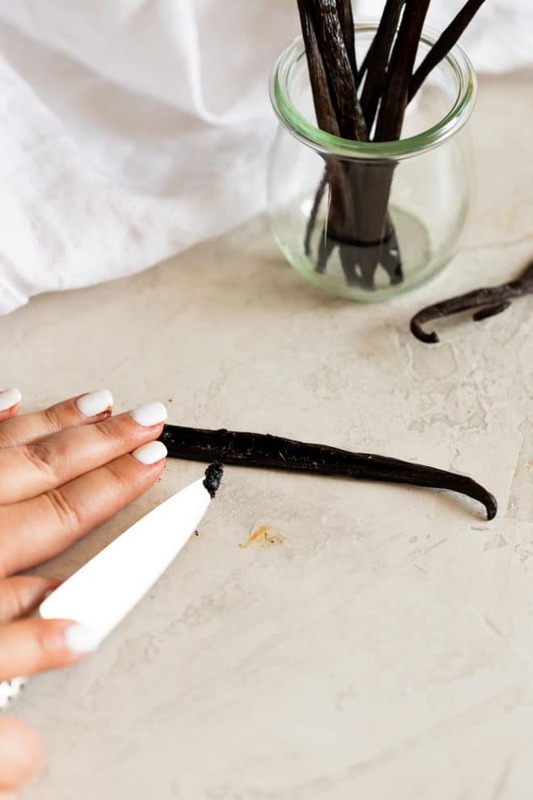 Unlike the dried up and brittle vanilla beans that you might receive from your local grocery store, vanilla purchased from reputable suppliers is oily, pliable and very fresh. High inventory turnover means your vanilla will be as fresh as can be. Look for companies on the web who specialize in vanilla beans; they know their stuff. Since buying vanilla beans is a sizable investment, the money you spend should get you the best bean possible. 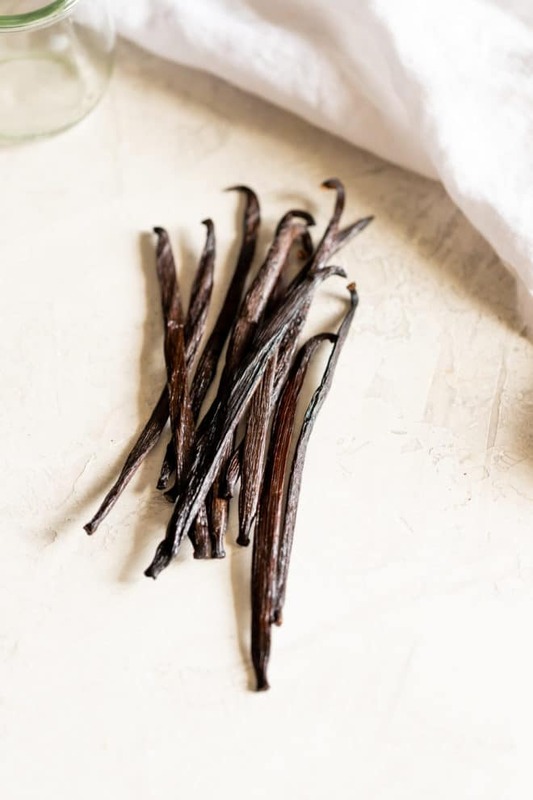 What are the different varieties of vanilla beans? Different varieties of beans vary in taste, depending on where they’re grown and how they’re cultivated. Madagascar: is rich and creamy, also the most popular type of bean used. Mexican: is bold and dark with tones of smoke. Indian Vanilla: full, chocolate, and a favorite among vanilla extract makers. What type of beans for making vanilla extract? There are two grades of vanilla beans: A and B. Buy the B! Grade A beans work fine, but they tend to be more expensive and primarily used for cooking and pastry making. Grade B beans yield the most flavor, since they are specifically meant for extracting. Don’t just pack as many beans as you can into that jar! There’s an easy recipe for making homemade vanilla extract. 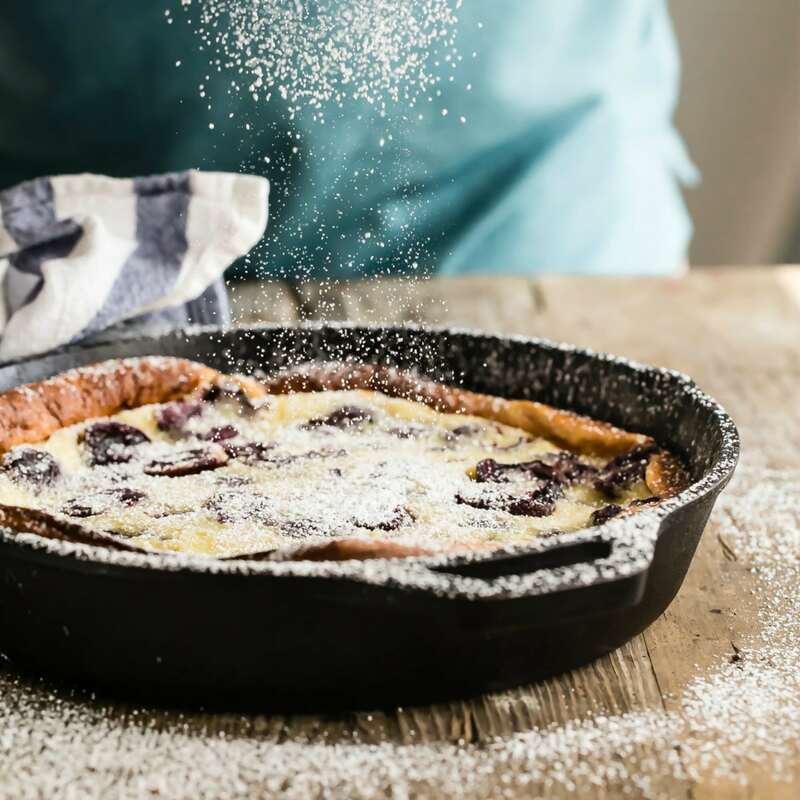 There’s two basic grades of vanilla extract, “single-fold,” and “double-fold.” Most good quality vanilla extract that you find in the stores is single-fold. More difficult to find is the double-fold extract, primarily used by professional bakers and pastry chefs. Most home bakers are just fine with single-fold vanilla. No matter which one you decide on, you’re still making vanilla extract for less money than what you can buy in the store. 5 beans per 8 ounces alcohol. This ratio is the one to remember for almost all diy homemade vanilla. 9-10 beans per 8 ounces alcohol. 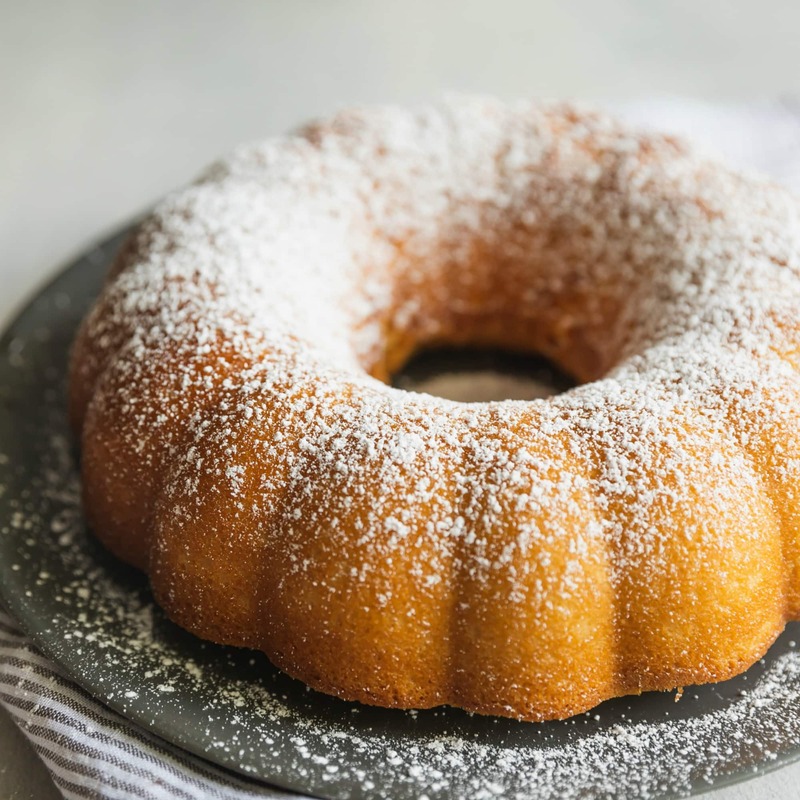 This ratio gives a much stronger vanilla flavor that you can’t get simply by doubling the amount of vanilla extract you use. 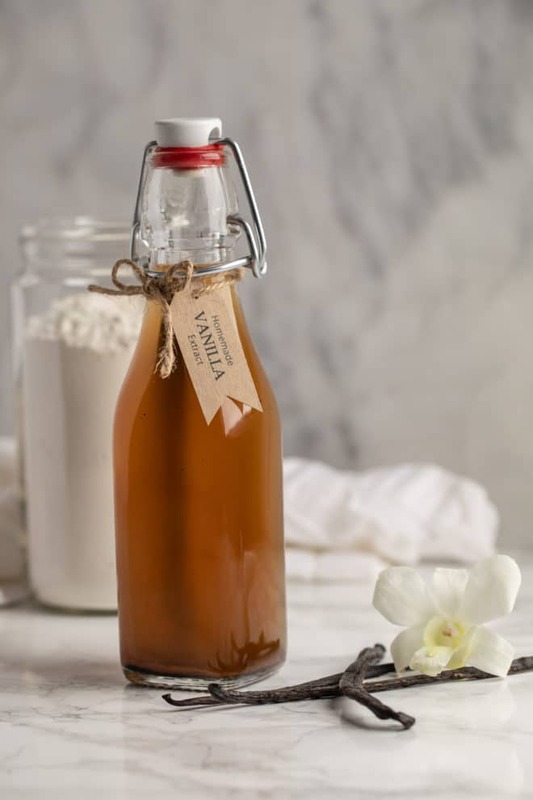 DIY vanilla extract is one of the easiest things in the world to make. All you need is two ingredients: vanilla beans and vodka. Oh, and a clean glass jar with a tight-fitting lid. First, you want to cut the beans in half, length-wise. You can do this with a sharp knife, or with a pair of scissors. Gently scrape out the seeds from inside of each pod. Scrape these into a small saucepan. Add the vodka to the pan. Heat the vodka vanilla mixture gently over medium-low heat, with the saucepan covered. It should be hot and steaming, but not boiling. Pour the vanilla, seeds and all, into the glass jar. Allow to cool to room temperature and screw the lid on. Store in your pantry. Every few days, give the vanilla a gentle shake. After six weeks, taste the vanilla. If it’s strong enough to use, use it! If not, let it sit a few weeks longer. If you like, you can cut the pods into 1-inch pieces, and add them to the saucepan. Not totally necessary, but our goal is to get the highest ratio of bean:vodka as possible. If you want to leave your pods whole for looks, add them to the jar instead of the saucepan. This method gently heats the vodka/vanilla bean mixture, which shortens the time required before you can use the extract. If you’re not comfortable heating vodka, you don’t have to. Just add everything to the jar you’ll be making the vanilla in, and that’s fine. Let the vanilla festival begin! You just made the best vanilla extract in the whole wide world. What kind of alcohol is best for vanilla extract? Vodka. Can you make vanilla extract with rum? Can you make vanilla with bourbon? Yes, but I like vodka, hands down—it makes the best, most pure vanilla flavor. Ideally you want something with a high alcohol content (at least 80 proof) and a neutral or complementary flavor to the beans. It doesn’t even have to be fancy vodka–the beans are fancy enough. If you definitely need an alcohol-free vanilla extract, use glycerin in place of alcohol. Don’t heat the glycerin, though–just add the sliced beans and the glycerin together. Can vanilla extract go bad? Properly stored, vanilla extract can last indefinitely. Keep your bottle out of the sun, in a dark cool corner of the pantry, and you’ll be fine. 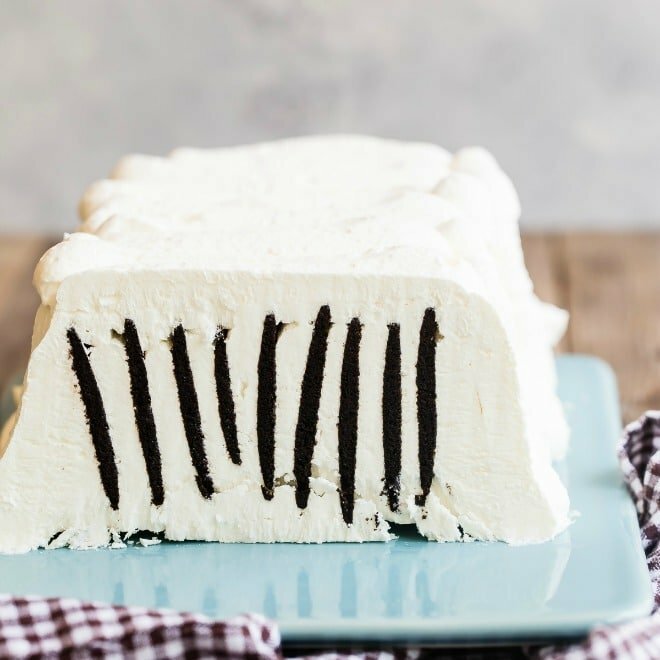 What can you do with leftover vanilla beans? Don’t throw them away! When you strain the extract, you can use the pods in a few other delicious ways before throwing them out. 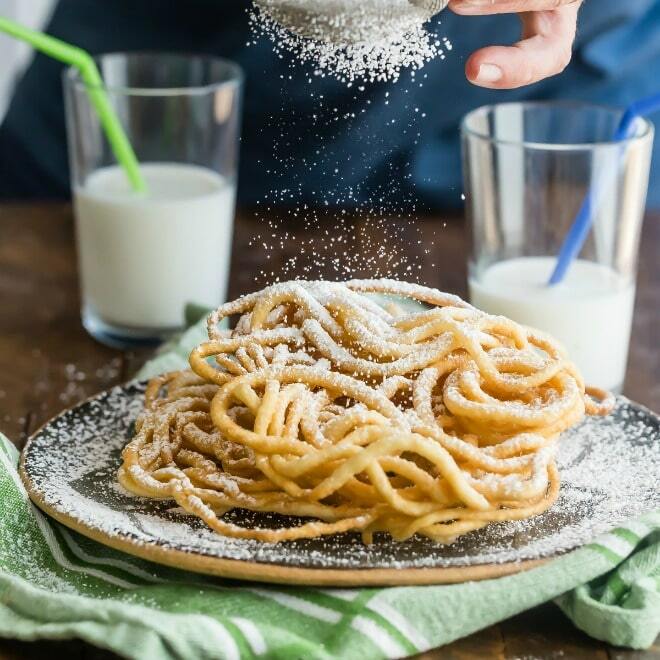 Vanilla sugar: Bury them in a bowl of sugar to gently flavor it. Or make a simple syrup withal’s flavored with vanilla pods. Poached fruit: Poached pears, apples, quince, prunes–there’s no fruit that doesn’t love vanilla poaching in red wine or syrup. Coffee and tea: Add a pod to your morning pour-over for an ethereal morning pick-me-up. 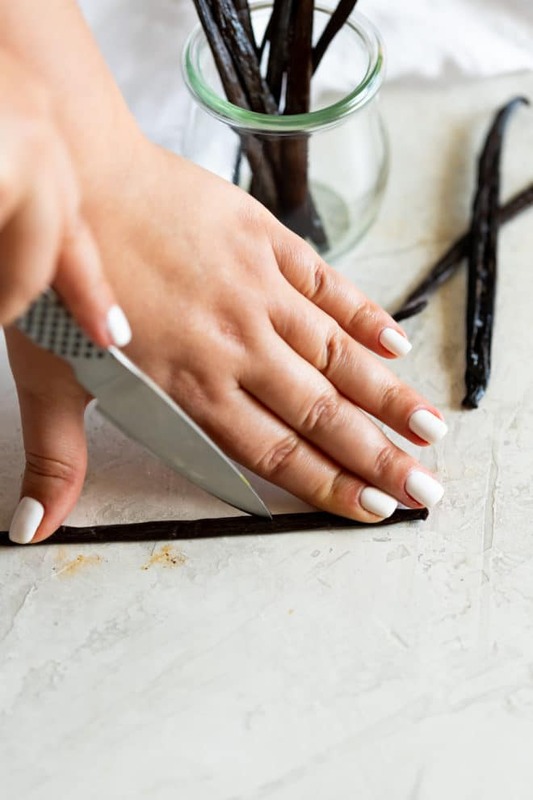 Slice vanilla beans in half lengthwise. Using tip of paring knife, carefully scrape out seeds and transfer to small saucepan. Cut bean pods into 1" pieces and add to saucepan. Cover the saucepan. Pour mixture into jar with tight-fitting lid and let cool to room temperature. Cover with lid and store in dark place for at least 6 weeks (or up to 10 weeks for a stronger vanilla). The seeds and pods will settle so shake jar gently once a week or so. Feel free to taste the vanilla mixture at 6 weeks. If it's not strong enough, close the lid and let it sit longer. 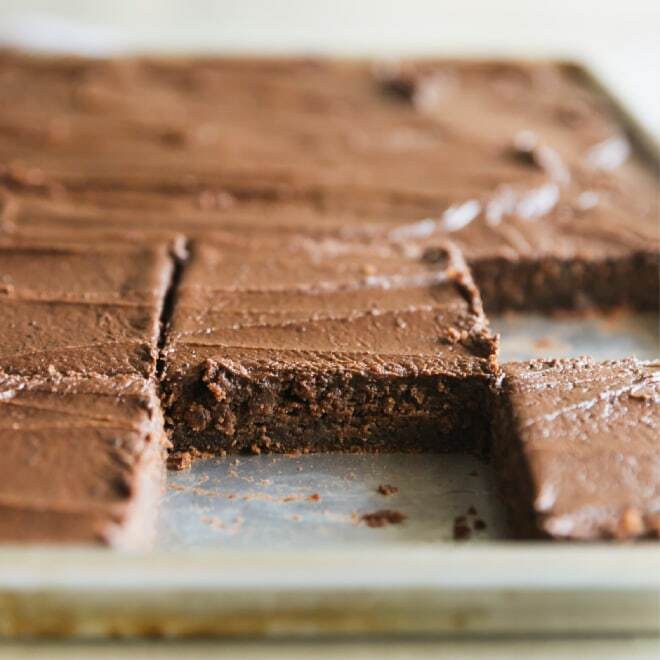 Once you remove the pods and seeds, the vanilla extract stays at that strength. Line fine-mesh strainer with 2 coffee filters and set over liquid measuring cup. Strain vanilla through filters and transfer liquid to a clean jar with tight-fitting lid. Vanilla extract will keep in the pantry indefinitely. Vanilla beans can be purchased online much more affordably than in most gourmet shops.